There are many types of English saddles. There is much to consider when purchasing saddles. What you choose depends on what type of disciplines you and your horse enjoy. Do you compete in jumping, endurance, dressage, side saddle, or all purpose riding such as trail riding? Do you ride gaited horses with a park seat, flat seat or saddle seat in the English style? How is your horse's conformation? Does your horse have a large barrel or high withers? Is your horse thin? Does the saddle roll and slip because your horse has a withers that is not prominent? What is your figure or physique? You must consider not only your horse, but the rider, as well. 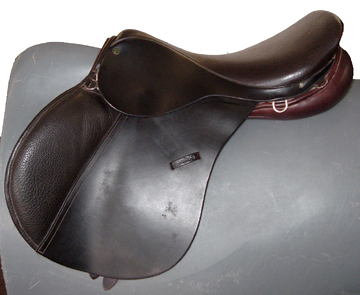 Let's take a look at the different type of saddles and examine the differences. 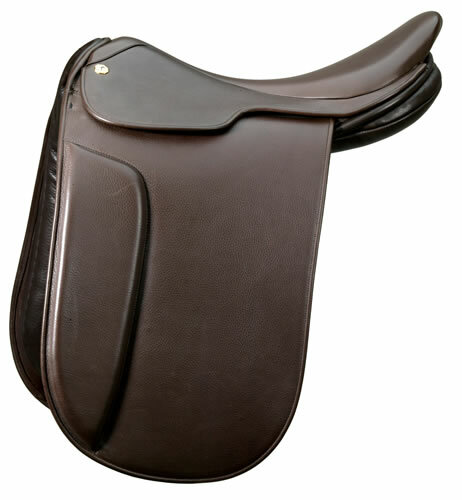 Having an understanding of why a saddle has specific features will help in the selection. Jumping saddles generally have a slightly forward tilt that allows the rider to get into the jump position more readily. The seat is shallow for the same reason. The shorter stirrups and flaps allow the rider to change position from forward seat to balance seat. It facilitates an easier transition. The knee rolls give the rider a bit more stability. Jumping is quite dangerous even under the best of circumstances. It is best to have every possible safety advantage possible. All-purpose saddles are just how they are billed--that is, you can use them for an array of purposes. They can be used for jumping, dressage, or trailing or pleasure riding. Saddles are expensive. Of course, if you are into a specific discipline and showing it is best to have the correct type saddle for what you are doing. "This type of English saddle is recommended for who prefer general/pleasure riding since they allow the rider the best of both worlds. They are very comfortable, secure and versatile. 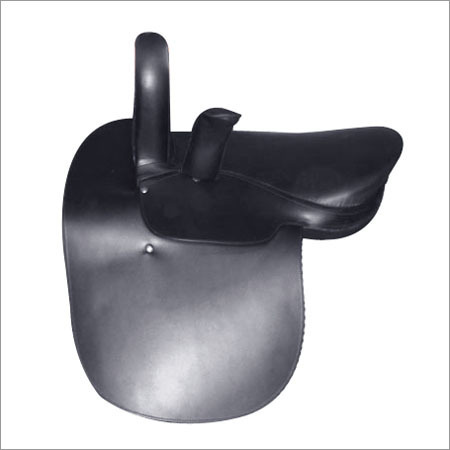 These saddles are also suitable for low-level show competitors since it permits the rider to enter various events without laying down the cash for multiple saddles. Once you go beyond amateur events you will want to strongly consider purchasing both a dressage saddle and/or a jumping saddle such that you can squeeze out every ounce of performance and efficiency. Remember that an all-purpose saddle is a jack-of-all-trades; you can use them for either type of event, but they will not function quite as well as one designed specifically for a particular event." 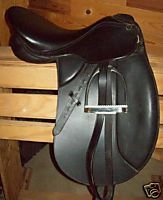 The gaited horse community often uses Lane Fox saddles because they have a flat seat. You can get "behind the motion" by allowing your weight to be behind the center of your horse or behind a balance seat position. They way the saddle is conformed it does not interfere with the shoulder action of the gaited horse. These saddles are very uncomfortable. It is like sitting on a board. My friends, who show gaited horses, use these saddles, but only in the show ring! My friends also use Trooper and Ranger saddles, as well, with the gaited horses. My husband, Bill, had a Trooper saddle custom made for his horse, Rusty. Rusty is a good size horse with a wide barrel and shorter coupling. He is a beauty. The Trooper sits up on two side runners (like pontoons on a water plane). This takes the rider and the saddle off the horse's spine. He puts a Tacky Pad underneath. Bill really likes this saddle and tells me that it is a very comfortable ride. I do not like anything that puts distance between my horse and myself. I like close contact. 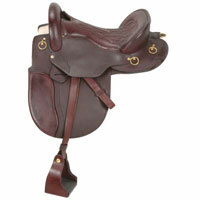 Endurance saddles come in English, Western and Australian stock saddles. They are made for distance riding of any kind. I have an endurance saddle (a Collegiate) and really like it. 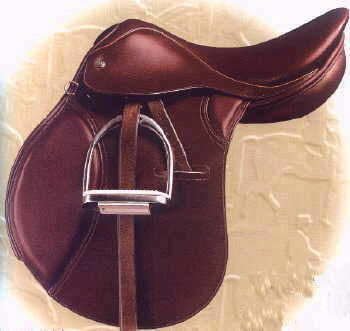 It is an English endurance saddle style--very comfortable--with a tilt and flaps that work well on the gaited horses. I can get behind the motion when gaiting and ride a balance seat when trotting or cantering. My horse is 5-gaited. I have a Barefoot Treeless Saddle of English design and love it. It is flexible, soft, very light (about 10 lbs) and adjusts to the horse's back in all directions. My treeless saddle moves with the horse rather than creating a barrier of a stiff tree. Horses move more relaxed and free because no tree is constricting the shoulder. No pressure under the cantle gives relief to short and flat backed horses. My saddle is stable on my horse's back. My saddle provides very close contact with my horse and helps horses and riders with back issues. 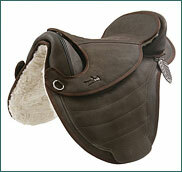 Many riders find relief from pain because the saddles are so soft and cause less jarring to the rider's back. Beginner riders learn to feel the rhythm and find balance much faster. Treeless saddles are a popular training tool. "Sidesaddle riding is a form of Equestrianism that uses a type of saddle which allows a rider (usually female) to sit aside rather than astride a horse, mule or pony. Sitting aside dates back to antiquity and developed in European countries in the Middle Ages as a way for women in skirts to ride a horse in a "modest" fashion while also wearing fine clothing. It has retained a specialty equestrian niche even in the modern world."